Show this coupon and save at Magnificent 7 in Branson! Tap coupon to enlarge. Experience a journey through 7 decades of your favorite music with the Magnificent 7 Show. One of the most energizing experiences you will ever witness. 7 first-class entertainers and over 200 costume changes coordinate with 75 production numbers from the 1950’s through the today. Non-stop musical action, dancing, comedy and so much more! The team of 7 singers and dancers are led by Joe and Tamra Tinoco along with their 11 year old daughter Talya, who make sure that the Magnificent 7 Variety Show is unbelievable entertainment. Age doesn’t matter. From the moment that the Magnificent 7 Variety Show begins, you will feel the energy of these performers. Regardless of your generation, you will take a trip down Memory Lane, going back to the swing era and taking you up to today. 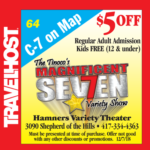 The Magnificent 7 Variety Show gives you a great meshing of everything from pop, country, rock ‘n roll, nostalgia, Broadway, Motown, Disco, Patriotic, Gospel and much more!